Well, 2013 is in the records and 2014 is well underway. Sorry for our lack of activity lately. If you’ve been paying attention, it’s been about a month since we’ve done a post. I’m sure you’ll forgive me. Holidays can be quite a busy time and we spent quite a bit of it out of town. Almost a whole week at the ranch with no internet connection which was quite nice, truth be told. If you’ve noticed, we’re not one of those blogs that puts out a new recipe every day. Or a set number per week. Or even on some kind of schedule. This isn’t out job, it’s just a hobby. We’re not looking to quit our jobs and go pro. Or get paid. Or write a book. We just do it for the fun of it. And if that means we get in a slump and don’t feel like cooking, or go back and revisit old classics for a while and have nothing new post, so be it. I’m just explaining why sometimes you’ll see long breaks here between posts. More power to those who can crank out recipes on a set schedule, but for me, I’m just going to take my time and only post quality recipes that we firmly believe in. Either that we’ve tried time and time again, tweaked to get just right or sometimes lucked out and nailed on the first try. Anyhow, enough rambling on. Nothing like a bowl of soup to warm the soul. 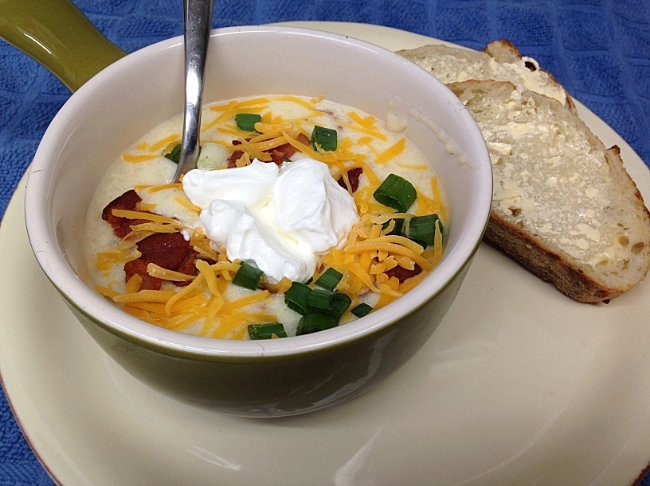 There are tons of recipes out there for Baked Potato Soup, but I thought I would go ahead and share ours along with a few tricks we like to use. Wash the potatoes and then pierce each potato a few times on each side with a fork. Rub with olive oil or canola oil and sprinkle with coarse sea salt. Place the potatoes directly on the middle rack of the oven. Cook for about one hour or until the internal temperature has reached 200F. Remove from oven, set aside and allow to cool. Slice the bacon into lardons or thin strips. Cook the bacon in a large cast iron skillet (shouldn’t bacon always be cooked in cast iron?) or a large pot over medium heat until crisp. Remove bacon but reserve the drippings. If you used a CI skillet, bonus points to you, but now you need to transfer the drippings to a large pot. Add the flour to the drippings and stir until combined, cooking for about 1 minute. While continuously whisking, slowly stir in the milk. Cook over medium heat for about 15 minutes until thickened while stirring occasionally. Slice open the potatoes and using a spoon, scoop out the pulp and add it to the pot. Mash the potatoes to your desired consistency. Some people like it more chunky than others, I’ll let you decide how creamy or chunky you want yours. Stir in a little over half of the bacon (leaving the rest for garnish), one cup of the cheese and season with salt and white pepper. We find that 2 tsp of salt and 1 tsp of white pepper was just about right for us, but adjust to your own palette. Stir until the cheese has melted and remove from heat. 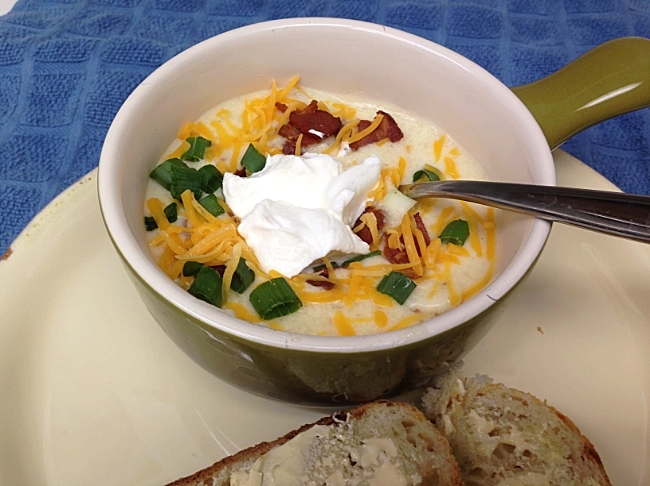 Ladle the baked potato soup into bowls and garnish with the remaining bacon, cheese and chopped green onions. Serve with warm, thick crusty bread. 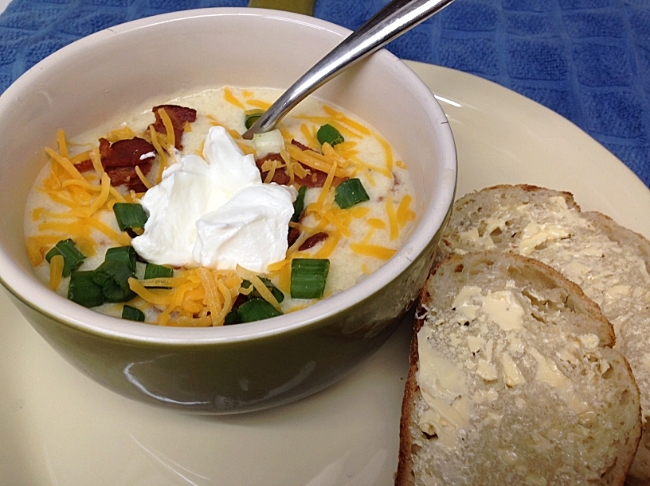 This is one pretty darn tasty baked potato soup, if I do say so myself. You have all the flavors of a baked potato. Bacon. Cheese. Green onions. Sour cream. But in a soup form. What’s not to like? I hear some people can be picky about the consistency of their baked potato soup. Some like it chunky, some like it creamy. My only advice is you are in control of that. So if you like it creamy, mash until your heart’s content. Or use an immersion blender if you have one. More in the chunky camp, don’t mash it quite as much. You control your own destiny…or at least this soup. Line the rack below your potatoes to catch the oil dripping off the potatoes for easier cleanup. Freeze bacon for 15 minutes to make slicing into lardons easier. Use white pepper instead of black pepper. It’s just an aesthetic thing, but who wants to see black flecks in their white soup? Save the skins to make potato skins later as an appetizer. They can be frozen for later as well. 4 potatoes will result in 16 potato skins. For the perfect baked potato, cook until the IT temp is 212F. For this soup, 200F will be fine. I love the soup recipes, and am happy to see more of them! It is really cold here in the East right now, and soup makes a kitchen smell great! I’m sorry. All Purpose flour. Do you think I should I go back and clarify that in the post? I do like King Arthur flour for some of my baking, like their bread flour, but when it comes to all purpose I generally just go with the store brand or maybe Gold Medal. Where are you located and how cold is it today? Here in Dallas, we woke up to 17 degrees with a wind chill of -7. Won’t get out of freezing temps today. Doubt I’ll be firing up a grill tonight. Haha — I should have known. I am probably the only person who didn’t realize that’s what “AP” meant. To avoid confusion, I went ahead and changed it. How far is Behlehem from Pittsburg? My Mom and her family were raised in a small city just outside of there. I should ask her the name. I’m a little surprised that it is colder here in Dallas right now. I’m just glad I’m not in Chicago where the temps are below zero. Bethlehem is on the east side of the state, so we get often Pittsburgh’s weather the next day. We have had a bizarre weather yo-yo the past few days, with lots of snow Thursday night, then near-zero temps over the weekend, and this morning the mid-40s and rain that washed away almost all the snow. I don’t think I’ve spent more than half an hour outdoors in Texas — I’ve been to Dell, and I’ve spent a couple of un-fun afternoons at DFW. We reached 105 a couple of summers ago (for one afternoon) here in PA, and it was a weird feeling. It was dry, so it wasn’t unbearable, but going for a walk felt like being on another planet. I think I’m happiest at 85 degrees — the kind of day when you don’t want a jacket even at dawn. Have you already done a post on a potato skin appetizer? Do you just fry them, or roast them? I love potatoes (had scalloped potatoes with baby Swiss last night), but have never used the skins on their own. I have not. Yet. I’m thinking I may do one this week on the grill which is how I’ve always done them in the past. I imagine you can bake them, but at what temp and for how long, I don’t know. The older I get, the more the cold gets inside me and just sits there, so I don’t head outside to cook as much as I used to either. I even put the cover on my grill. 😦 But soups. Soups are good, especially as the wind blows the temperature drops. Your potato soup looks delicious. I hope it helps chase your cold away! The country song keeps running through my head “I’m much too young to feel this damn old”. LOL, but I’m feeling it. I’ve been a wuss this year when it comes to grilling. I already feel a ton better today. Must have been all the naps and going to sleep at 9:30 all weekend. Sounds lame, but I must have needed it. Loved the way your chile pork roast looked, BTW. Your approach to blog posting is just like mine. Never did care for those posters that post just to be posting. Happy cooking! Exactly. I’ve tried to force myself to post more before, but I always get burned out and then take a break. In the beginning, I posted a lot, almost obsessed with it. Now I’ll just take my time. This was outstanding! Much appreciated.